Find, share, and collect all within Seesaw. No need for ten different apps, piles of paper, or a printer. Search by grade level, subject, and keyword to find activities made by real teachers like you. Customize any activity or create your own to differentiate learning. Unlock student voice, choice, and expression with open-ended creativity, right in Seesaw. Students use creative tools of their choice to respond to activities and reflect on their learning. 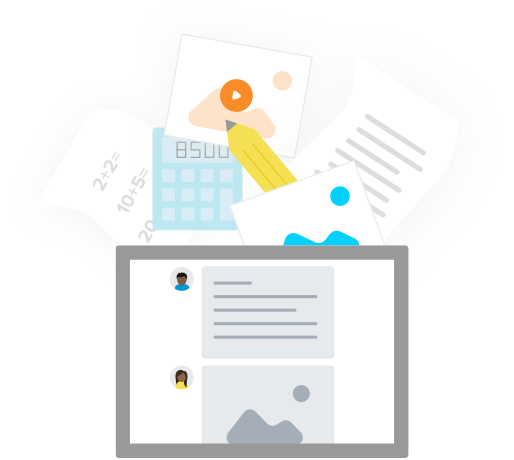 See how Seesaw Activities work on every device to deepen student learning and engagement. Seesaw works great on any computer or device. Bookmark app.seesaw.me on your computer and download the Seesaw app for your device and your students' devices. Look for Seesaw: The Learning Journal in the app stores. See step-by-step instructions for downloading the apps. Protecting your privacy is fundamental to our mission and business. Learn more about our longstanding privacy promises in our Privacy Center.